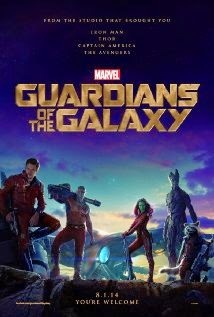 Plot: A misfit group is forced together and must use their skills to try to save the galaxy from a madman. Marvel has outdone themselves with GUARDIANS OF THE GALAXY. This could very well be the best movie of the summer and possibly one of the top ten movies of the year. It is gut-bustingly funny (to the point where we missed several lines due to all the laughter), it's exciting, the plot is compelling and the chemistry between the cast is near perfect. Another aspect of this movie that will please movie-goers is that this movie has three strong female characters all with agency. It's so nice to see an action flick that treats the female characters in a way that makes them important to the plot and they have the will and ability to affect things on their own rather than waiting for their prince charming to save the day. Children of the 80s will find this movie totally radical. For reasons that become clear in the movie, Peter Quill is essentially stuck in the 80s therefore all of his pop culture references are from that time period. It makes for some extremely funny moments. The writing for this film is so spectacular that you really have no idea if any of these characters are going to survive to the end of the story. It's refreshing to see a movie that doesn't protect its main characters to the point of taking the suspense away as to what may happen to them. This film can be wrapped up in two words. They will mean nothing to you until you see the movie, but once you do they will be epic. Those words are "dance off". Enjoy. One small warning: Unlike most MARVEL films, this one uses quite a bit of adult language. So use your discretion when considering taking the young ones. James Brown was larger than life. 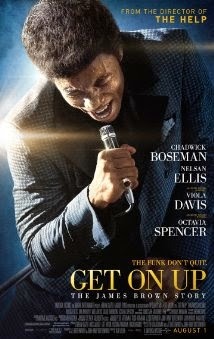 Director Tate Taylor found that out when he took on the challenge of trying to fit all of James Brown into a two-hour movie. It's something that can be done, and someone may eventually be able to do it well, buy Taylor's effort doesn't make the cut. The story jumps around in a non-chronological order with several story lines not coming together in a cohesive and understandable way until the last few minutes of the movie. In a movie with less content or fewer story lines it's a creative tactic that can add a compelling nature to a film, but in this case it's just confusing. Taylor also tries to cover so much material that he misses major moments. For example, there are major, life-changing events that happen during the course of the film that are merely mentioned and then washed over by the next story. It was frustrating to be told that something significant was happening, but not be able to see the aftermath play out on screen. Boseman does a fine job in portraying James Brown both on and off the stage, but his speaking pattern and accent are very difficult to understand. (I have a slight hearing loss issue and tend to read lips as an aide to understanding what people are saying. In this case it was very difficult for me to do that). It's not a bad movie by any stretch of the imagination, but it's not great either. It offers nothing to the audience that you can't get from waiting a few months and watching it on DVD.